My homemade suet is composed of animal fat, peanut butter, quick oats, corn meal, and flour. The animal fat I use is either lard (pork) or tallow (beef). It is served in wire baskets or in holes drilled into hanging logs. Since I began feeding it in log feeders I get yellow-rumped warblers, brown creepers and yellow-bellied sapsuckers. More common birds like flicker, downy, and red-bellied woodpeckers frequent my feeders as well as Caroline wrens, chickadees, titmice, and nuthatches. Blue jay love it and even juncos feed at my suet feeders. Unfortunately the invasive non-native house sparrow and European starling like it as well. An added benefit of making your own suet is that you control the ingredients. I feed homemade suet exclusively as birds prefer it to the store bought varieties that I've tried. The fat in suet supplies wild birds' energy needs, especially during the colder months of winter. Birds get much of their energy naturally from eating insects. Many wild birds feed on dormant insects as well as insect eggs all winter long. But fat from animals is a good alternative to insects and is relished by birds. To get an idea of the variety of birds you can attract to a suet log feeder watch this video. Commercially made suet cakes are readily available at bird feeding stores. These cakes are placed in specially made wire baskets which are hung in bird feeding areas. Birds cling to the baskets to eat the suet. Many commercially available suet cakes have lots of grain fillers (like millet) that suet eating birds don't even eat. When I've put out homemade suet next to commercially made suet, the birds always eat the homemade suet first. That being said, there is nothing wrong with feeding commercially available store bought suet. Birds do eat it and there are many different mixes. I suggest buying ones that have peanuts as an ingredient as birds seem to prefer it to non-peanut suet mixes. This recipe was published in the December 1994 issue of Wild Bird Magazine. Note: Technically, suet is the hard fat around the kidney and loins in cattle. Tallow is derived from this fat. But any fat can be used in suet mixes. You may want to add bits of dried fruit to the mix as well. I've added Zante dried currants to my mixes. It is one of the best dried fruits for birds because of its small size. Other dried fruit would need to be chopped into very small pieces. 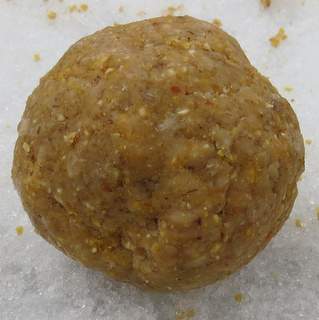 Makes six suet cakes sized 5" x 5" x 1¼"
Mix all dry ingredients in a large bowl. Melt fat and peanut butter together on low heat. Take off heat, and slowly add dry ingredients. 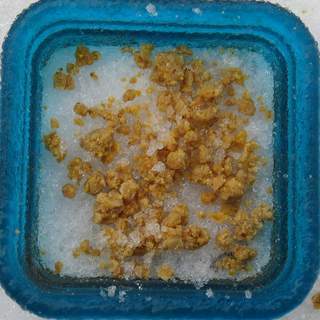 Spread on a cookie sheet, and allow to cool in the refrigerator or outdoors until the mixture is just hard enough to cut into pieces. Alternatively the mixture can be molded in used plastic suet containers that pre-packaged suet comes in. If serving in a suet log, no shaping is required as you pinch of a bit and stuff it into the holes in the log. Store suet in a freezer or fridge and use as needed. I store mine at room temperature in the winter because I go through it so fast. I Do not recommend substituting hydrogenated vegetable oils for the animal fat. Our Topeka butcher, Herman's Meat & Deli, gives away beef fat. It can be rendered and used in the suet. I used to use lard from the store until I learned that it is partially hydrogenated. Hydrogenated oils are unhealthy trans fats, so I avoid them. Besides it is better to use free fat rather than purchase lard. I make the corn meal by putting about two cups of cracked corn in a blender and blending until it turns to flour. This doesn't take long and it's better than store bought cornmeal which has been degerminated to prolong shelf life. ALDI has quick oats, natural peanut butter, and flour. They have the best prices on the ingredients. Dillon's has lard, natural peanut butter, quick oats, cornmeal, and flour. They have all of the ingredients for one stop shopping. It really isn't that difficult to render your own fat to make your own suet. Start with either beef fat or pork fat. Cut the fat into half inch cubes or shred it in a food processor. This will make the rendering process much quicker than using large chunks of fat. Place cubes or shredded fat into a stock pot. Place the pot on LOW heat. Do not try to speed up the process by turning up the heat. If you do you will have burn the fat. Stir the pot occasionally and cook for about an hour or two until the fat melts and becomes clear liquid. Once the fat is melted you will be left with cracklings floating in fat. Remove the cracklings and place the fat in containers. I use glass pint jars. Store the containers in the fridge or the freezer. In the winter I put the cracklings out for the birds. Blue jays and crows love them. Once you discover how easy it is to render fat you may start using it yourself for cooking. Animal fats have a lot of health benefits for us as well as the birds. Suet cakes placed in wire cages are the most popular method for serving the suet to wild birds. These can be hung from a shepherd's hook or place on the trunk of a tree. Woodpeckers especially like feeding from the trunk of a tree. My favorite method for serving suet is using a log with holes drilled in it. To create a log feeder, take about a 2' long log that is about 4" in diameter. Use a 1" spade bit to drill holes about an inch deep into the log. Put an eye screw in the top of the log and hang from an S hook. The holes are filled with the suet mixture and the log is hung from a tree limb. I built my own feeder by taking a 4" diameter log and cutting it to about 2 feet in length. Next I drilled 1" holes in it on four sides. An eye screw is attached to the top to allow it to be hung from an S hook. 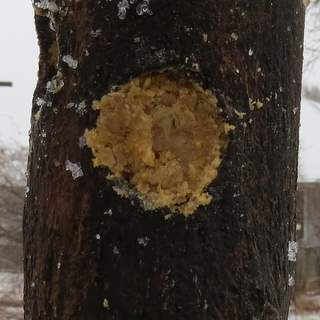 I stuff the holes with home made suet and hang the log on an S hook in a tree. I see flicker, red-bellied, and downy woodpeckers clinging to the log as they eat suet. Chickadees and titmice will eat from it too. But flickers, yellow-bellied sapsuckers, brown creepers and yellow-rumped warblers are my favorite birds to see at the suet log feeder as they do not come to seed feeders. Since I started feeding suet in a suet log, I like to keep the suet at room temperature. This keeps the suet soft making it easier to fill the log by pressing bits of suet into the holes in the log. The log is so popular that i have to refill the holes on a daily basis in the winter. The logs are so popular with the birds that I keep 3 logs in my yard. Suet is an excellent bait that can be used for trapping starlings, a non-native invasive species. Starlings compete with our native birds for nesting sites as well as food. If you feed suet, you've probably had hoards of starlings consuming all of your suet. To trap them I put the trap under the suet feeder and bait it with suet. They can't resist the suet and walk right into the traps. 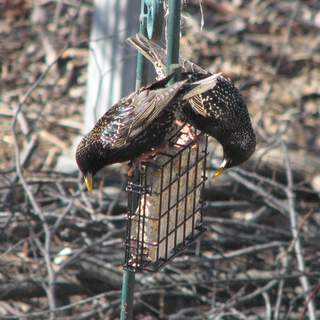 Learn more about using suet with Starling Control Traps.